All right, the New Year is here and with it a new list of good resolutions and you decided, that as usual for a change, you were going to forget them tomorrow keep them! Maybe, just maybe, I could try to make you cook all a little bit more from scratch, feed new flavors and new textures to your children. And even maybe cook with them so that they get more exposed to what they are being offered. That would be a great thing to add (and keep) on your list, n'est-ce-pas? I have not decided what to put on my list yet except that since I started this blog, I have been even more aware of what/how we eat in my family... and that's something I want to keep doing... It's so fun to see/hear my children pretend play "making soup" when they are in their bathtub with a bucket, a pot, and a whisk (yes, a whisk!)... or to see them try new things at a Dim-Sum place! At least, I know that I could take them anywhere around the world and we'll be able to share local food (not just hamburger, fries, and crackers! )...and enjoy it! One of the last few things we baked with my children over the break are Chouquettes (sweet cream puffs with pearl sugar on top (which you can find at the IKEA food store)). 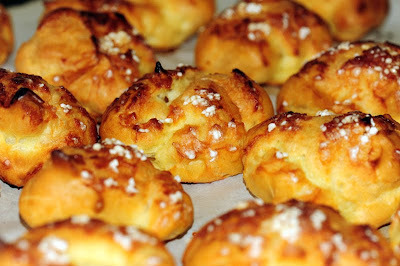 Chouquettes are ubiquitous in French boulangeries-patisseries! They are always put in a small white paper bag that has become the "standard" size you buy. Unless you are like my husband and need double or triple that quantity! You just want to make sure they are really fresh because that's when they taste the best. I like chouquettes because they are really easy to make and you can size them to make them the perfect bites for your children. Although sweet, they are not too sweet. Despite their name, they have no cream in them...and yes, because they "puff", they are quite light! A perfect little pastry for after the over-indulgence of the past few weeks. Something great to start baking with your children to keep your New Year resolutions have another excuse to go to IKEA! Bonne Année et Bon Appétit! Line a baking sheet with parchment paper and make sure you have everything ready. In a large pot, over medium heat, heat water, salt, surgar and butter together. Stir until the butter is melted and the water begins to boil. Remove from heat and dump the flour at once, stirring rapidly until smooth and it does not stick to the side of the pot. Let the dough cool for 2-3 minutes, stirring to let the steam get out. This will allow not to cook the eggs. Add the eggs, one at a time, stirring very briskly. Spoon out small quantities and drop them on the parchment paper, evenly spaced. Press pearl sugar on top of each chouquette. Use a lot and really press. Bake the chouquettes for 20 minutes. They have to be brown and well puffed. Turn off the oven, open the door and let them cook for another 5 minutes. Make sure you have EVERYTHING prepared before you start making them because you have to be fast in the recipe execution. A teaspoon full of dough makes the perfect size for children. I love chouquettes so much! Never tried to make them at home though. Thanks for sharing the recipe. Happy New Year Gaelle!